A bold shift dress crafted in Japanese crepe fabric that’s ultra-flattering. Did we mention the pockets? Totally necessary. Made in NYC. Classic shift with intentionally loose fit through waist and hips. Mid-thigh length. Our model is 5’8.5” and wearing a size 2. Armhole re-shaped for maximum comfort and coverage. Bust dart adjusted to best fit a fuller chest. Curve of hem reshaped so that it can easily be worn untucked or tucked-in. Our model is 5’11 ½” and wearing a 14W. For more details about the fit of our extended sizes, please see our page About Extended Sizing. 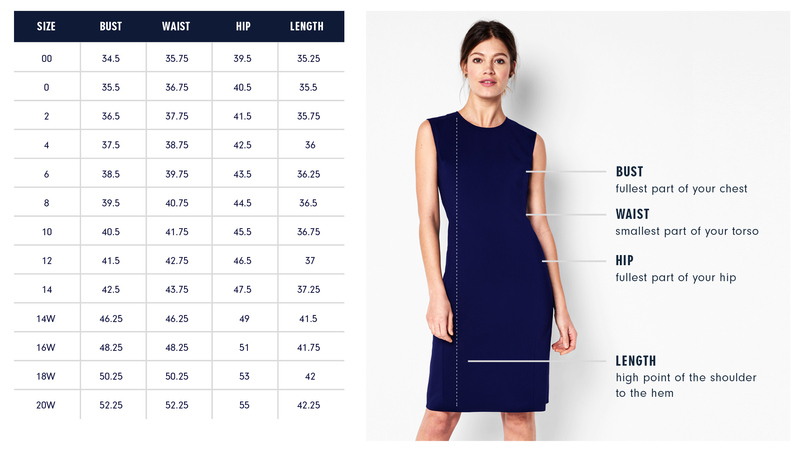 Below are the exact measurements of the Stanton Dress. All measurements are in inches. For general brand fit, sizing, and measurements, please visit our Brand Fit & Size Guide. Classic shift with intentionally loose fit through waist and hips. Mid-thigh length. I was inspired by the mod fashion of the 60’s and embodying that attitude in a work-appropriate dress. I started with an updated take on the 60’s shift dress shape and mirrored the geometry of the silhouette with bold color-blocking. Features: Bracelet length sleeves and side seam pockets. Fully-lined.